Ironwood Townhomes are one of the only townhomes for sale in Keystone CO Real Estate that are located a short walking distance to both the Mountain House and River Run in Keystone, CO. Built in 1994, there are 14 – 3 and 4 bedroom townhomes with either 1824 or 1880 square feet (does not include garage or unfinished basement areas). Each Ironwood Townhome has a private, attached 1-car garage as well as space in front of the garage for another vehicle. Some of the townhomes have views of the Snake River and are able to walk out the back door and be at the Snake River in just a few steps. Other Ironwood Townhomes have filtered views of the Keystone Ski Resort. While one can easily walk to the ski slopes or village areas in Keystone there is also bus stop less than 100 feet from Ironwood Townhomes. Most of these Keystone townhomes feature their own private hot tubs as well. The homeowner association fees for Ironwood Townhomes include cable tv, water/sewer, trash and snow removal and common area maintenance. 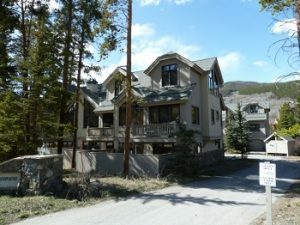 If you are someone looking for a property in Keystone Real Estate that is larger than the average condo but within walking distance to the ski area, Ironwood Townhomes are a property worth considering in Summit County Real Estate.